I am assisting an elderly neighbor of mine in trying to determine the value of a lucite Nixon bracelet that she has. If anyone can assist Ellen with an appraisal or information on the item, please click on the comment button above or email appraisals@loriferber.com and we will forward your comments. I have a piece of the World Trade Center South Tower #2, it’s from the original construction. My grandfather was Irving Galt, he was the Assistant Attorney General for New York in the 70’s under Louis J. Lefkowitz, the Attorney General of New York. My grandparents raised me and I spent a lot of time in the Towers when I was a kid, my grandfather had one of the original offices on the 47th floor. He gave it to me when I was 5 years old, it’s been on my desk my whole life. Not a typical political memorabilia item but one we thought would stir some interest and debate as to its value. Seth is interested in helping in valuing the item or offers to buy or auction the item. The photos include one of WTC identification cards from the grandfather. Tim acquired this Lincoln Inauguration Badge this week. He is not sure of its value or if it is an original and would appreciate any help from knowledgeable collectors. He was told that the item belonged to an "old ladies husband" along with other Lincoln items he collected. He does not believe it is a ferro and believes it has brush marks on the picture like someone brushed the gel coat on the picture, and wonders if this is normal. We have inherited a passed down pieces from John Adams lineage. The following is what we have received and would like your assistance in seeing what they are worth. Billfold: Has John Adams. 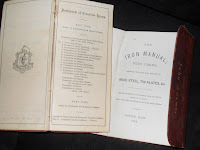 engraved on it On the inserted manual by grandson charles Francis Adams the little book that reads The Iron Manual: With Tables dated 1868. There is also a compartment that would be used for money to be held. This is in excellent condition although the binding is showing age. The 2nd little book is dated 1880; and reads: List of committes of the Massachusetts Legislature 1880. Boston; Rand, Avery and Company, Printers to the Commonwealth -- 117 Franklin street. If you can help Penny please click on the "comments" button above or email appraisals@loriferber.com and we will forward it to her. I have large piece of wedding cake presumably from the wedding of Grover Cleveland and Frances Folsom. It is enclosed in a Tiffany box that is possibly covered with silk. On the outside of the box has a small card signed by Cleveland & Folsom, and there is a hand painted date, June 2, 1886. This box was enclosed in an outer box for mailing, and the original wrapping paper shows it was addressed to Dr. A Bailey, Buffalo, NY with the only return address being Executive Mansion. John & Jacqueline Kennedy Signed Portrait? hi i am jonni: i live in north carollina and I have a large signed picture of the president jfk and jackie o. Both signed it and gave it to my father-in law when he became captain of the police dept. when they were in the white house. I am disabled and my husband and i thought since our daughter graduate next year and wants to go to college we would be interested in selling theses items. I found a medallion on a chain commemorating, of all things, the assassination of the this president. Ironically, my grandfather was there the day he was shot and I have no doubt he purchased this piece when it became available as a keepsake.